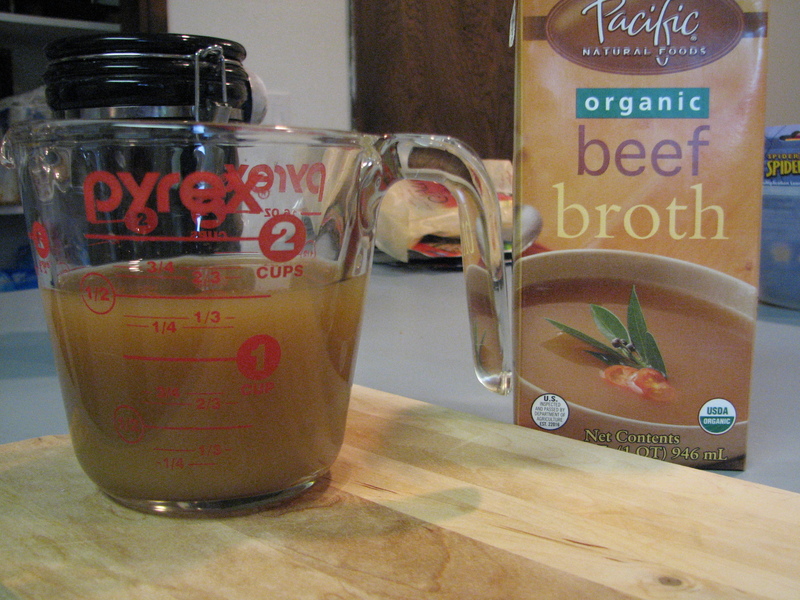 In a large stock pot over medium/high heat, heat the oil and add the beef pieces. 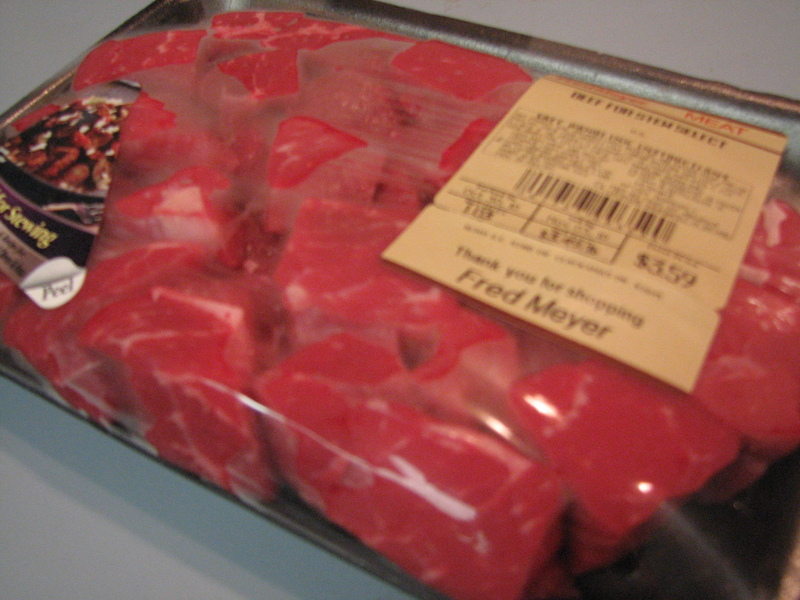 Sprinkle the flour over the beef. Brown the meat on all sides. Pour in broth and red wine. Sprinkle in salt, marjoram, thyme and black pepper. Bring to a boil. Cover, and reduce heat. 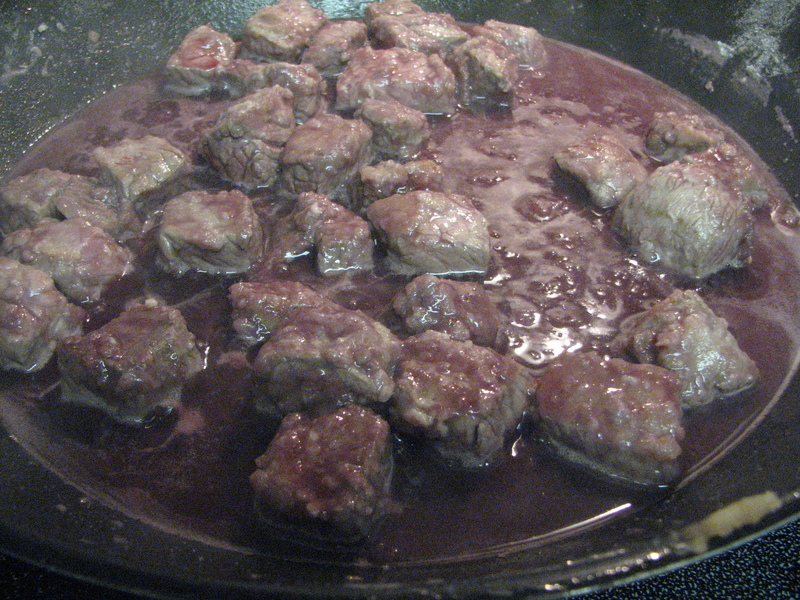 Simmer for 1 1/2 hours or until beef is tender, stirring occasionally. 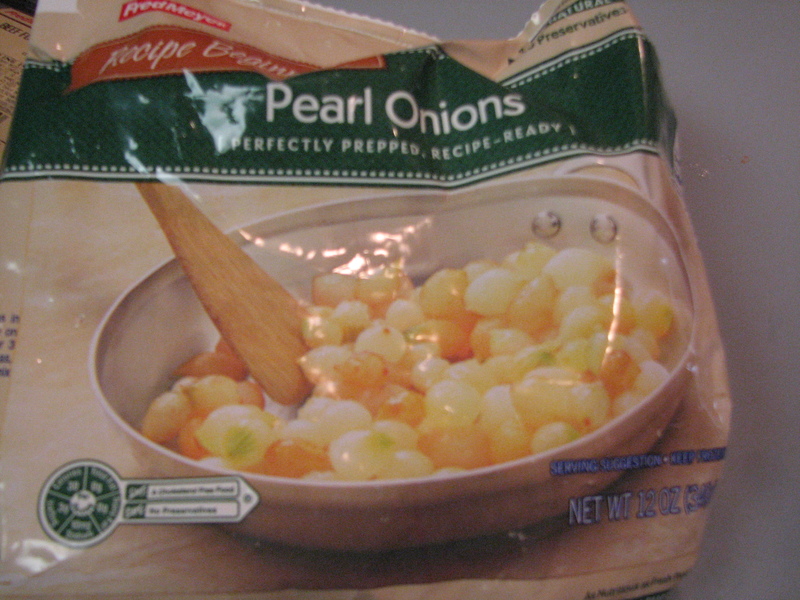 Add mushrooms and onions to the pot. Liquid should just cover everything. 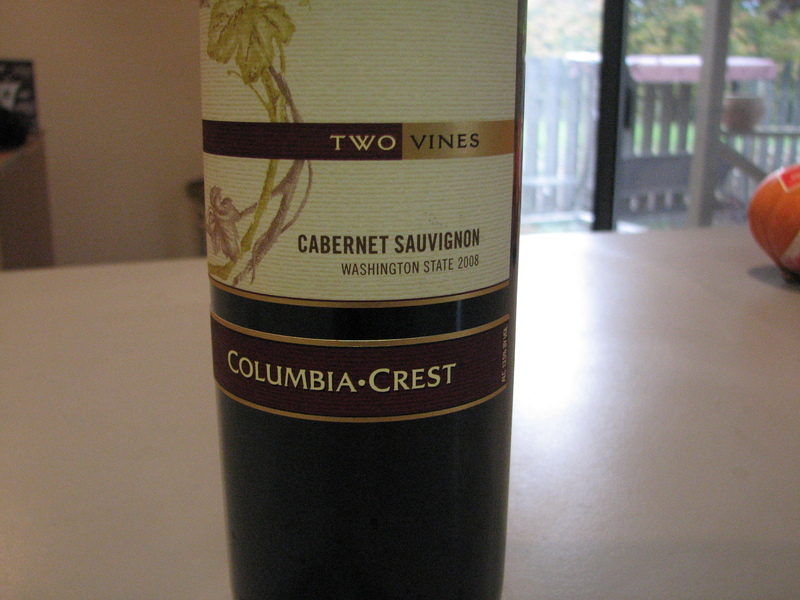 If necessary, add some more wine to cover. 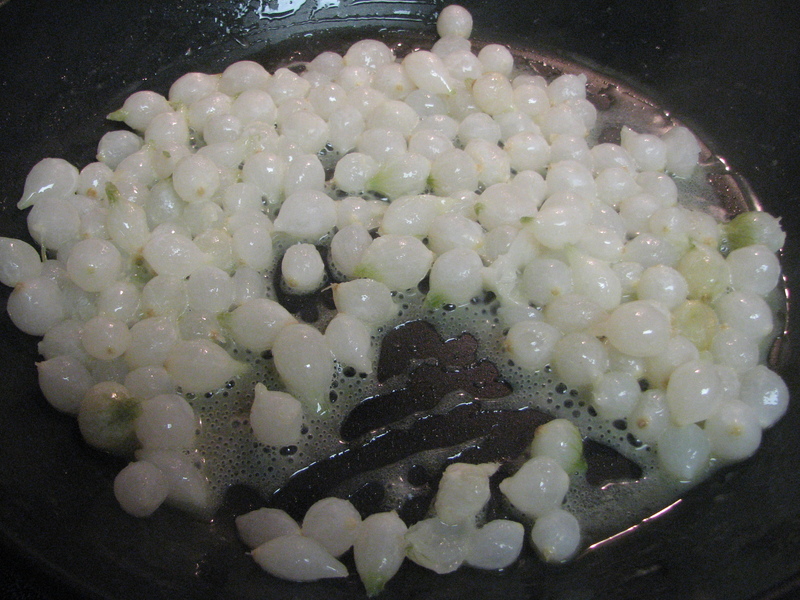 Cook until onions are limp. There were parts of her recipe I wasn’t wild about so I sort of combined her recipe with another one I found on Allrecipes.com. I skipped the mushrooms (of course) and added more bacon. 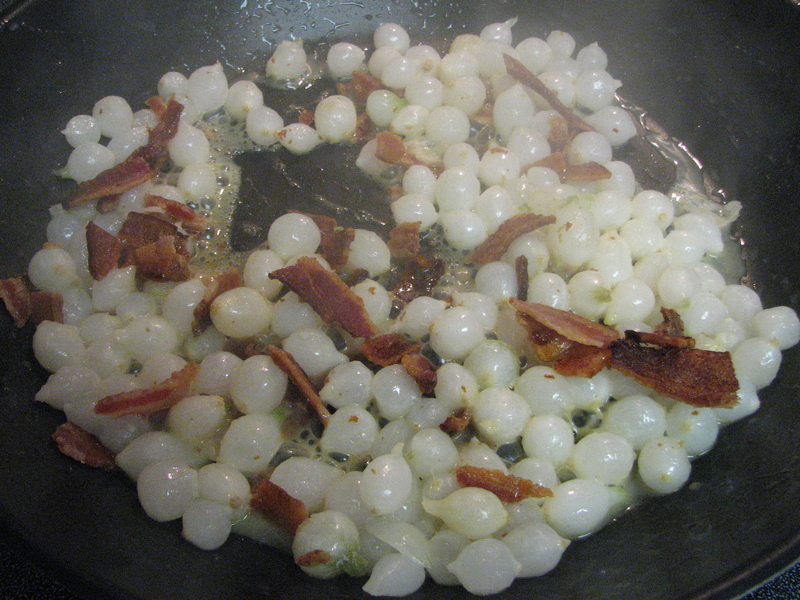 First I cooked the defrosted Pearl Onions and the bacon in some butter. It smelled so good cooking in the skillet. Butter, onion and bacon? Yum. I dumped the onions and bacon into the cauldron while I prepped the meat. I rinsed it, dried it and then browned the meat in the skillet with butter. 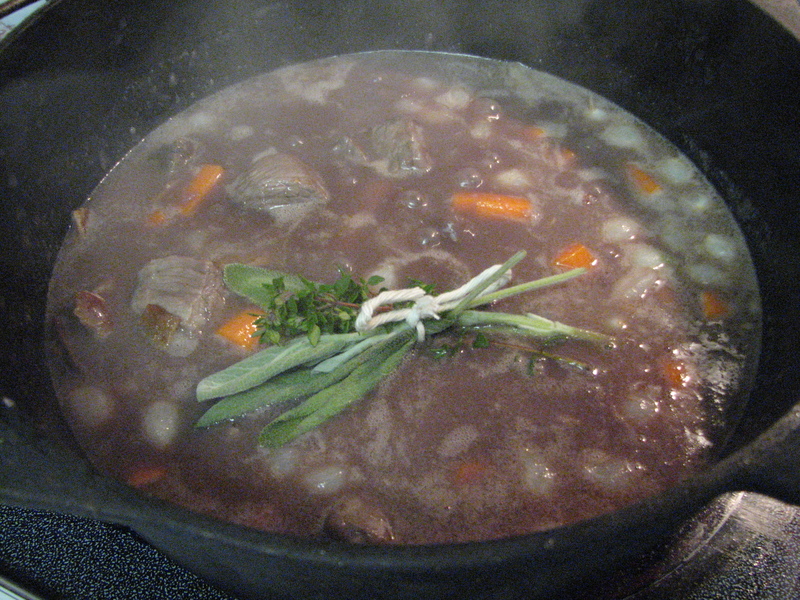 Next, I poured the red wine into the skillet. 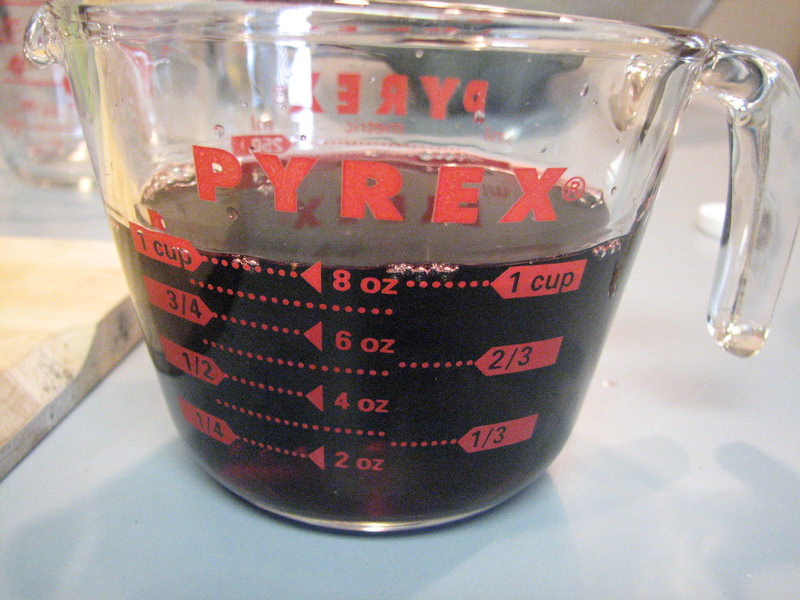 Adding the flour made the wine and butter thicken up. I guess I added it too quickly because it was a tad on the lumpy side. Oh well. I added the beef broth and let it boil. 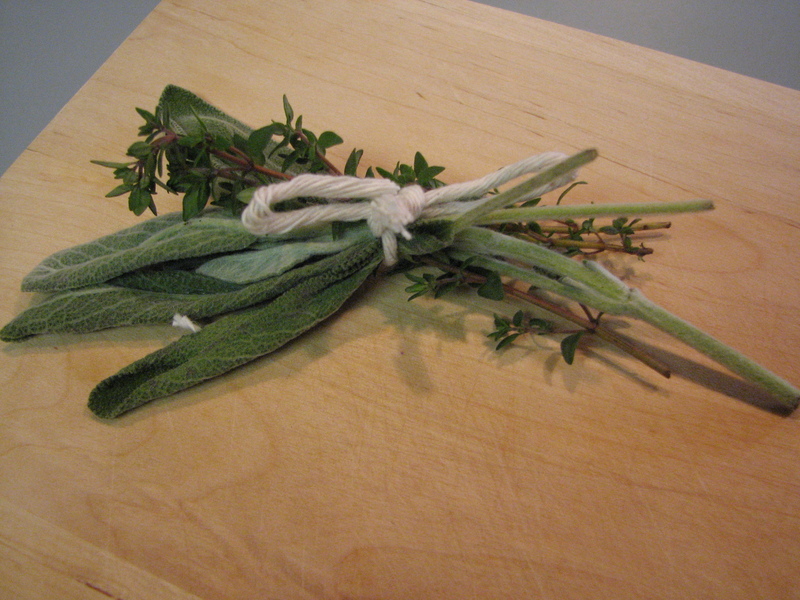 Next up: tying together some sprigs of sage and thyme. I let the herbs simmer in the broth. 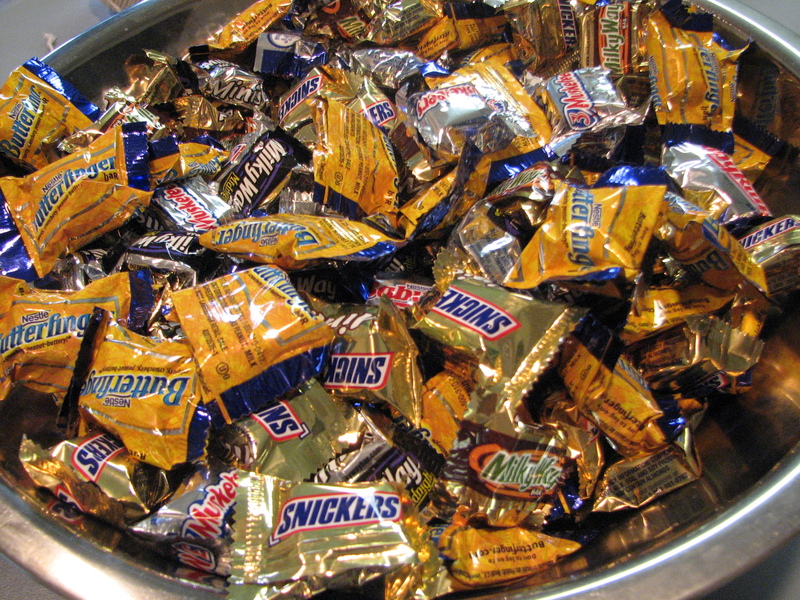 I got the CANDY ready for the kidlets! Yes that is a huge Costco bag of goodies. 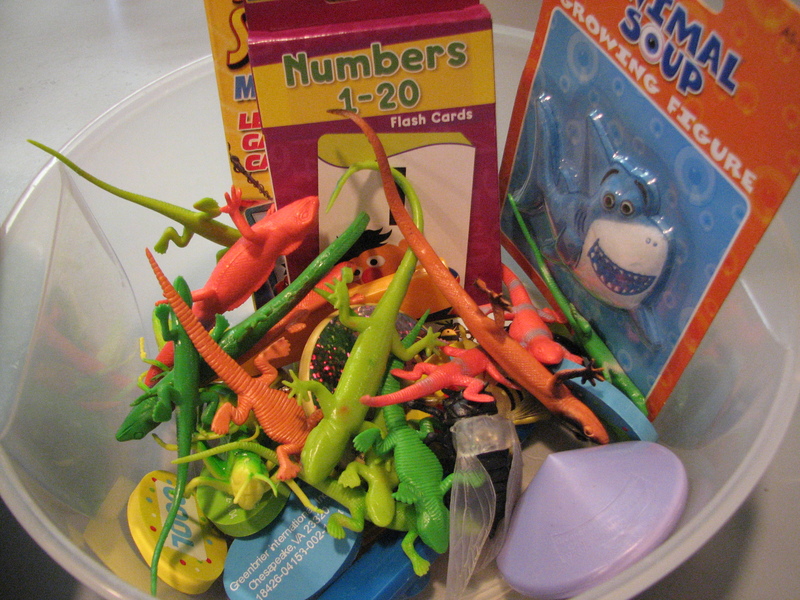 I also bought some toys at the Dollar Store to pass out with the candy. 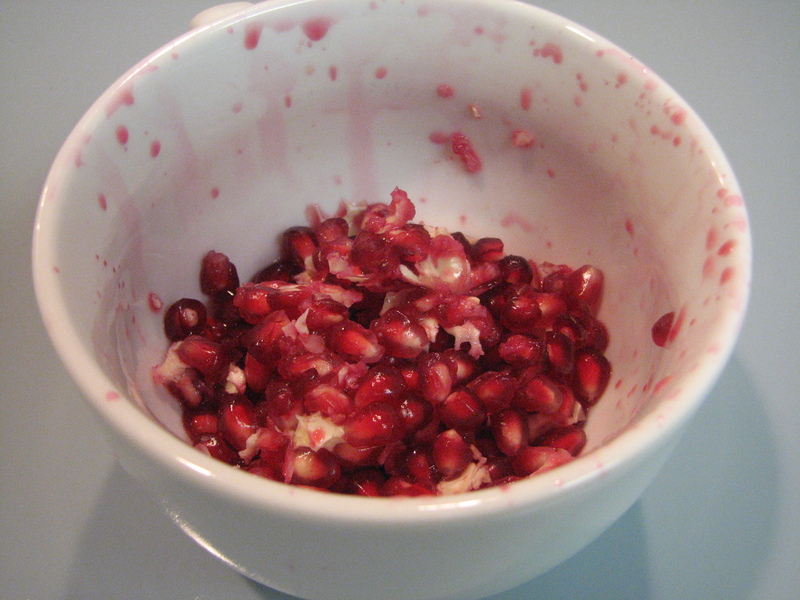 The “appetizer” before dinner was Pomegranate seeds. 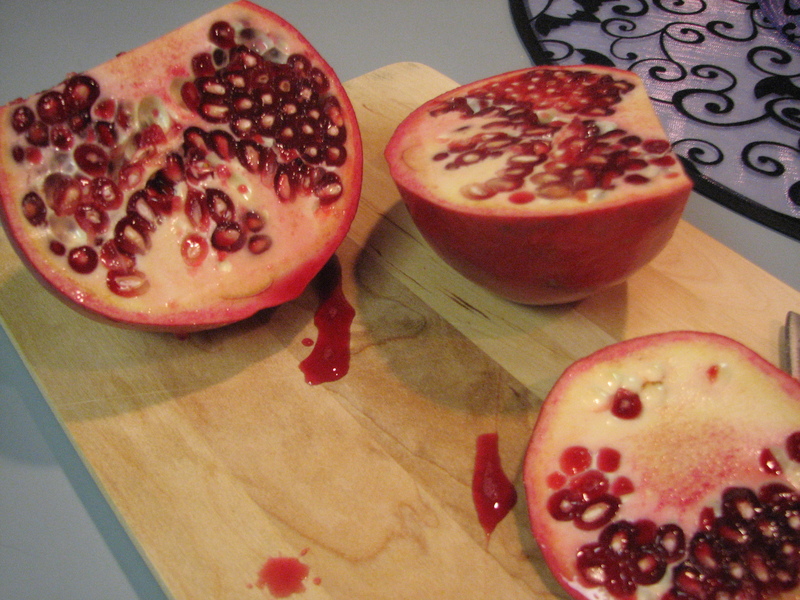 In ancient lore, Persephone was tricked into eating Pomegranate seeds from Hades, the King of the Underworld. He kidnapped her and brought her to the Underworld. Persephone’s mother, Demeter, negotiated with Hades for her return. They agreed that she would spend 6 months in the Underworld and then when it was time for Spring, Persephone could return to the land of the living for 6 months. Thus began the Season changes. 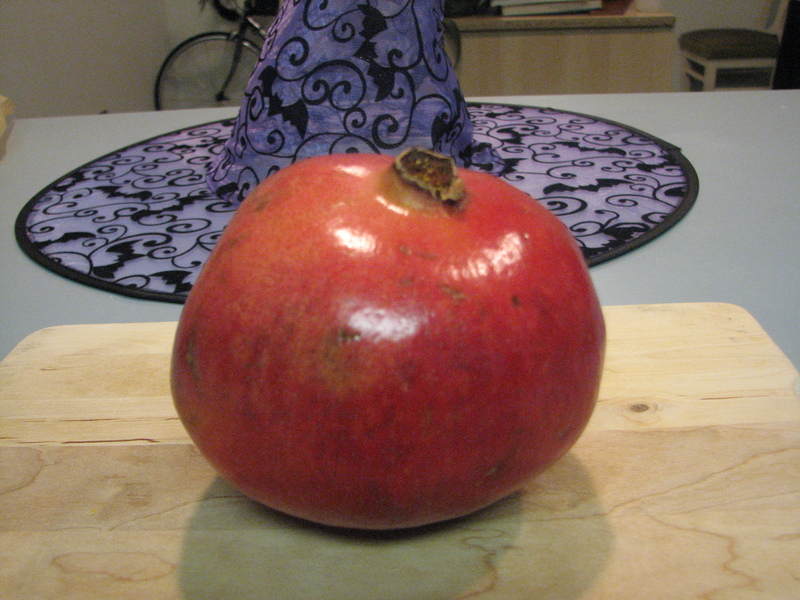 Halloween traditions include eating Pomegranate seeds and last night was no different. They were sweet and delicious! Dinner turned out great. 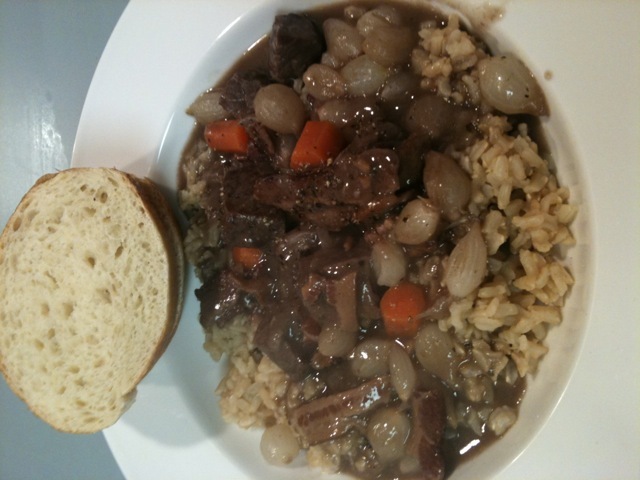 I cooked brown rice in a mixture of leftover beef stock and water. 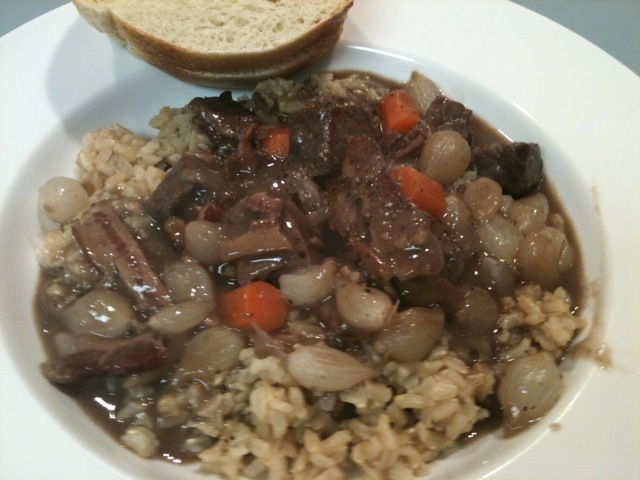 I served the Beef Burgundy on top of the rice. I made an offering plate for my ancestors that have passed (another Halloween tradition) and set it on the back porch. 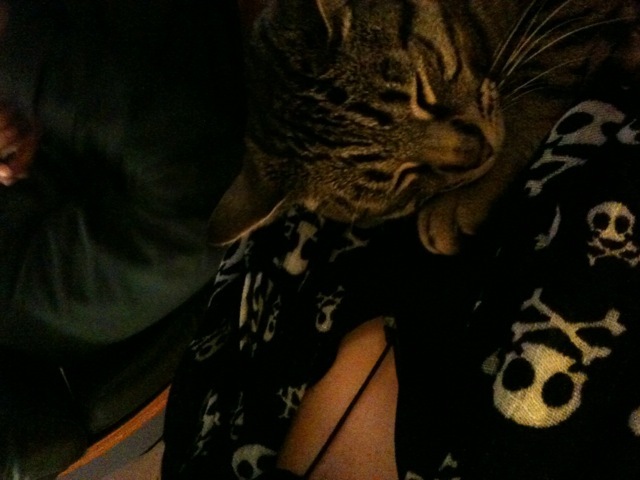 Michael and I settled in to watch movies while the trick-or-treaters came. We watched “From Dusk til Dawn” and then the premiere of “The Walking Dead”–which was amazing! My other cat, Maya, even made a visit! She’s usually hiding. 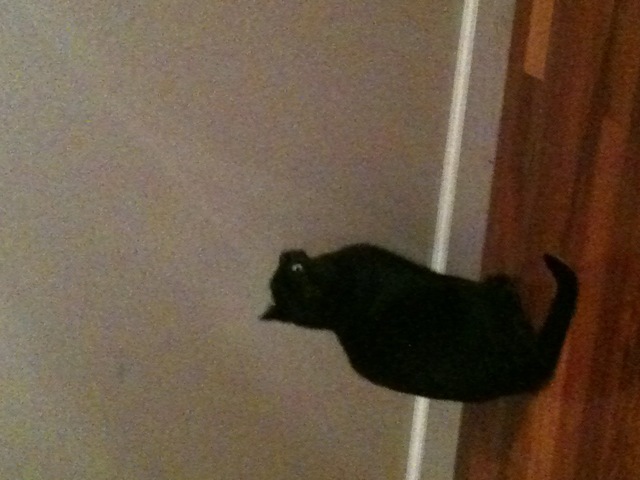 She decided to come out and join us (and chase the fly in the house). We didn’t have as many trick-or-treaters as we did last year. 🙁 Kind of a bummer because I love seeing the cute costumes (AND we have tons of candy left over!). All in all it was a great Halloween! QUESTION: How was your Halloween? What was the cutest costume you saw? 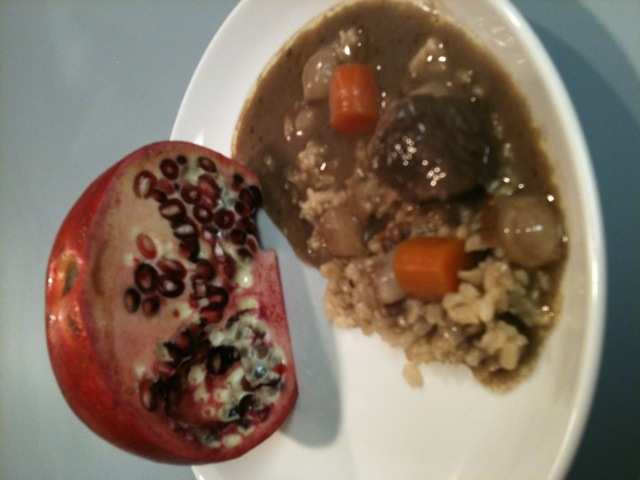 Thank you for sharing not only your recipe but your Halloween with us! 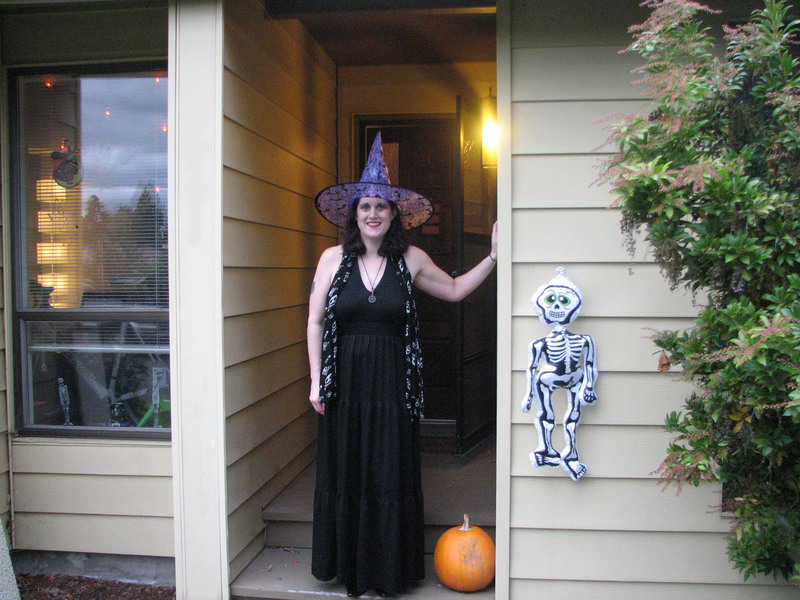 A very merry Samhain to you! Thanks Mere! How was your Samhain? I will try that method next time. I’m pretty new to cooking…at least harder things. I’m trying to get the hang of it but dang some things are complicated! We actually met up with Chris’ mushroom foraging friends on our way home on Sunday. You’d like the hike if not the bounty. Giving out candy to the adorable kids always makes me a little verklempt. They’re just so cute and sweet. We had one little boy who waved to us and said Bye for like 5 minutes. So adorable! But I think we probably had a few less than last year. I really love passing out the candy to the kids. They are so cute! I’m a little biased. I thought my kids were pretty cute, and no one in our neighborhood had the same costumes as them. One went as an astronaut and the other went as T-Rex. It was a good time. 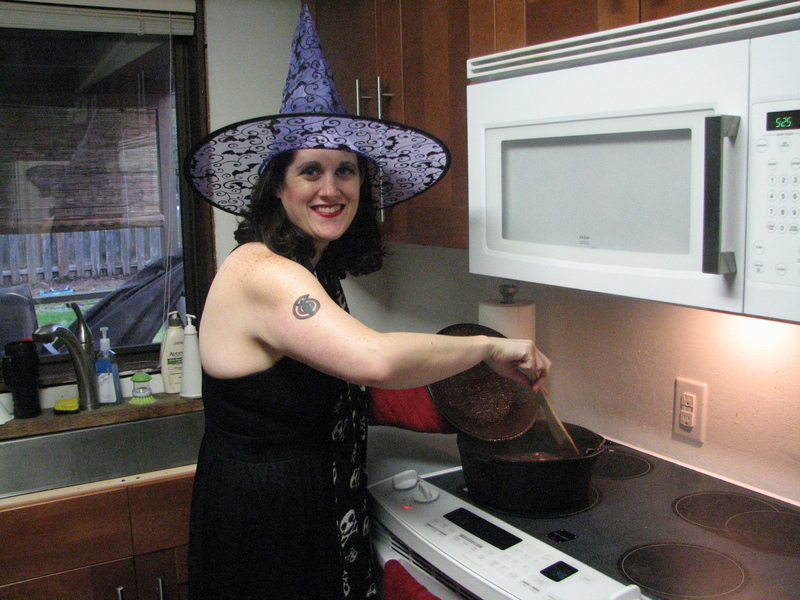 I love the picture of you in the witchy costume at the stove with your cauldron brew. Thanks! 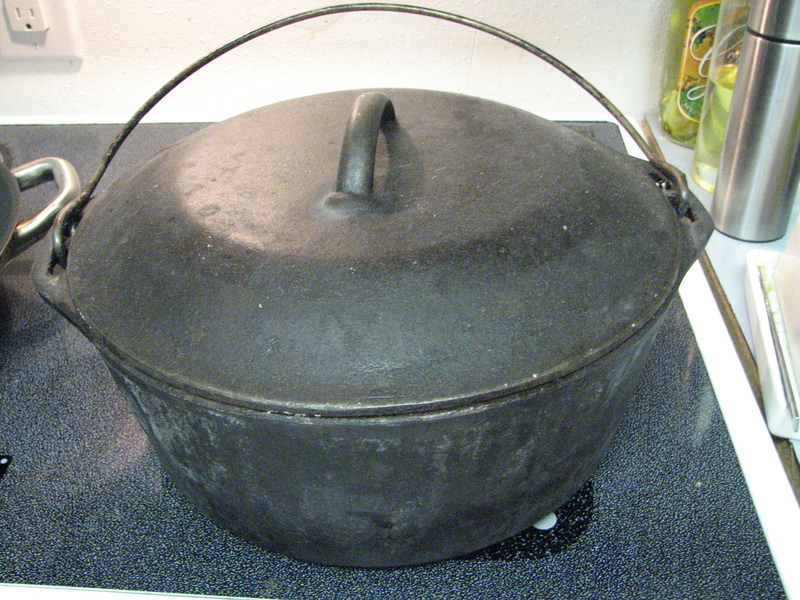 I love my Dutch Oven.